Visit the CHRIST THE LORD Reading Group Guide. VANCOUVER: We are in the last days of this amazing tour, having met more journalists who have given us an opportunity to talk about the new novel, and having met more readers at bookstores. I thrive on seeing my readers, and on the emails they send giving me their personal response to my books. Vancouver is one of the most beautiful cities we've visited, with some of the most distinctive architecture. The sunset the first night was gorgeous, with a green sky under a bank of rosy cloud. INVITATION. If you have the inclination to write a letter with your response to Christ the Lord that can be published on my website, please, by all means send it to me. As you can see we have begun posting the readers' responses because they have been nothing short of inspiring. HURRICANE KATRINA. I'm receiving news each day from the south that is heart breaking. People are NOT GETTING their insurance checks or their FEMA checks. I urge all of you who are suffering to write to the President himself. Find the email for the White House and use it, and when you write, send a copy to your local newspaper and if possible, to your local officials. The suffering you are enduring is dreadful and in a nation of this much wealth, it is unnecessary. Urge Mr. Bush to help directly. Do not be silent. QUESTIONS ON THE ROAD. I'm being asked many theological and religious questions. When I get back to my home in California, I will write more on these. People are far more interested in my conversion to Christianity than I ever expected. MY HEART FELT THANKS TO ALL OF YOU, MY READERS FOR SUSTAINING ME DURING THIS JOURNEY TO FAITH. 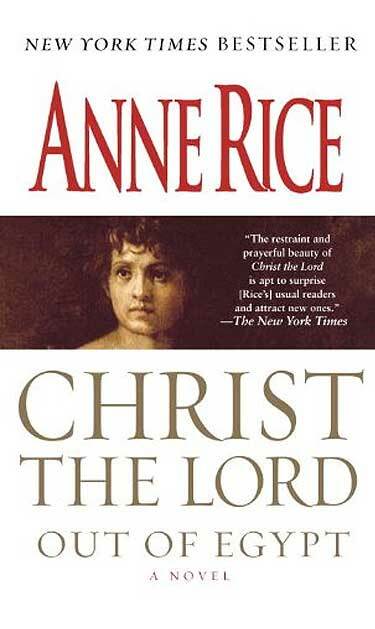 Love in Christ, Anne Rice. The pace of our tour continues to be delightfully hectic with more and more Christian media showing an interest in this novel and what it attempts to do. There isn't time to do justice here to the experiences we'ver had. Let me say quickly that our four days spent in Birmingham were inspiring and comfortable and truly wonderful. I didn't want to leave ever. One lovely experience was visiting the chapel at EWTN, Mother's Angelica's network, and finding that the Blessed Sacrament was on the altar in the traditional monstrance (a case with a pedestal for the host). A few moments of prayer there were a powerful restorative, and the traditional trappings of the chapel were a comfort. There was also an outdoor chapel at EWTN which featured magnificent stained glass windows which had been donated to Mother from Catholics in Chicago whose church was slated for the wrecking ball. This too was a solace since we've lost so many old churches in the past decades and so much great Christian art. Meeting Raymond Aroyo at EWTN was an exciting experience because I watch him all the time; but he will run his interview soon enough; I should not to describe it here. His cordiality and his charm were much appreciated. Three events in Birmingham lifted my spirits to the stars. The first was my visit to Temple Emanu-El for service on Friday evening, during which Rabbi Jonathan Miller invited me up to the podium for questions; this man is dynamic and warm and courageous. Not only did I feel welcome there, I was enchanted by the music, the chorale singing in Hebrew. And the friendly reception of the congregation was very simply terrific. I felt close to the Lord in this synagogue. I felt I was glimpsing Jesus' own people who have maintained their traditions for over 3,000 years (nobody knows how long really), and this was a privilege I'll never forget. The next visit was to Southside Baptist Church on Saturday, with Rabbi Miller again in attendance, and this time the host was Rev. Steve Jones whom I'd met the night before at Temple Emanu-El. This spirited, jovial, friendly man made me feel at home at once; and the event also included Fr.Ray Dunmyer from the local Catholic church; we were all on the stage together, discussing my new book, which was a fantasy come true. The essence of the fantasy was that these people took the work seriously, and came together to do that, and I couldn't have asked for more. My friend Dwayne Johnson is the one who brought me to this moment and I will be eternally grateful. I'm aware here that I'm not doing justice to what happened in these days in Birmingham. I saw love in action; I saw faith in action; I saw the children of God. On Sunday, I went to Mass at Our Lady of the Valley Church where Fr. Dunmyer to my astonishment spoke warmly of the novel and of my writing it in his homily. I could scarcely believe this was happening, this kind of trust and support. Again, I was stammeringly grateful. I was floating. Maybe I can write about this visit later on, including more about all of it, including my meeting with Jake, the owner of the Alabama Booksmith, a wonderful host, and also something about the rank and file people of all three houses of worship, and their openness and kindness. I fear I can't get the depth of it here. Let me just say again. I didn't want to leave Birmingham. I wanted to stay there forever, amid these gentle and truly southern people who seemed to know how to love one another and how to give to one another in day to day life and in faith. We went on from there to Chicago, the big, muscular beautiful city of bright winter light off the lake and the fiercest most energetic people I've ever seen anywhere. Again, we found a great reception; reporters here as everywhere were open to the book; and the readers are the most outgoing I encounter on a tour. From there it was Toronto, another city of incredible size, strength and energy where people seem, like those of Chicago, to positively thrive off the cold. It has been great here, with old and new readers at the signings, and again with reporters who want to talk about the spiritual content of the work. Let me say that I'm still getting a flood of emails and they are sustaining me as much as anything else. Thank you! And I am answering letters as fast as I can. Take care and thank you for checking in here. Today we leave Miami for Birmingham, after a wonderful signing at Books & Books in Miami Beach. Since I was there last, Mitch Kaplan, one of the great saints of the book world, has added a thriving cafe to his bookstore in Lincoln Mall. The whole Mall was full of vitality. It made me long to return to Miami Beach where I had a condo for so long, and felt myself part of what is going on there. However I think that my future is booked. I will go to Israel at the end of the year, walk the streets of Jerusalem and Nazareth, try to visit Bethlehem, and then return to work on the second book in the life of Christ the Lord. There will always be a special place in my heart for a young man I met last night, named Pierce who was buying copies of Christ the Lord for his teachers in high school. I was so moved by this, and by his enthusiasm. Emails continue to pour in. Most of them are truly wonderful; many are from new readers who have Christian experiences to share. A very few are negative and some contain hatred of gay people, which I can not abide and I try to keep my patience as I answer them and explain that my role now is to be part of my church, and to fight for acceptance of gays by the Catholic Church and by all Christian religion. I recommend that those of you who are troubled by my stance study some of the new books which are so very good at analysing what little the Bible really has to say about gay people. We are in midst of a great revolution with regard to human rights and sometimes it is difficult for us to separate God's law from simple traditions and customs. We do not have to be slaves to traditions or customs. Guys, I ask that you not send me novels to read in your emails, or stories or long poems. I can not meet your expectations and hate to disapoint you. I am trying to read every email that comes, but i am behind right now. Thank you for your continued outpouring of enthusiasm for this book, and for your responses to the variious media appearances. Never have I been so committed and so happy in my work. HELLO EVERYONE, We are leaving New York this morning to go to Miami Beach for a signing, after a wonderful two days here in which we participated in an on stage event at the 92nd Street Y, and also attended Mass at St. Patrick's Cathedral on Saturday evening. The Cathedral itself as many of you know is very simply magnificent with white marble statues and Stations of the Cross that are overwhelming in their beauty and incredibly inspiring. I have been receiving hundreds of emails as the result of interviews I've done on television and on radio. I'm trying to answer as many of these as I can. I've been asked many questions by people who are curious about the book, so LET ME POST SOME GENERAL ANSWERS HERE: I am a practising Catholic, a believer. The book, Christ the Lord, is written from the standpoint of a believer. No, I will not be writing anymore novels with my vampire or witch characters. I have moved beyond these novels and have committed to writing only for Jesus Christ in a more direct way. I appreciate your inquiries about the earlier books, but I am unable to answer them in any depth now. I am eager to answer questions about my new endeavor because I feel Christ the Lord is the finest book I've ever written, and it represents the culmination of a long personal journey in which I searched for the most meaningful task I could do. Unfortunately I can not now give interviews about the earlier books or help with term papers and questions for research projects on these books. Perhaps some time in the future I will be able to meet these requests. FOR THOSE OF YOU EMAILING ABOUT THE NEW BOOK: If your comments can be shared with others, please do let me know. Some of the letters I've received are truly beautiful and filled with fascinating personal stories and accounts of people's journey to Christ, or brilliant remarks on the novel and what it is attempting. I would like to share some of these with Knopf Publicity and perhaps on my website, but will only do so with your express permission. NOW LET ME ADDRESS A VERY IMPORTANT TOPIC: GAYS AND GAY MARRIAGE. As I said I am a Roman Catholic,and a true member of my church. However I am very optimistic that in the next few years, we will see the Roman Catholic Church and other Churches open their arms and their doors to gay believers. We will see our theology developed and refined to embrace gays as part of our Christian community, which so many of them are already. I am optimistic that the church always moves forward, though it moves very slowly; and that we Catholics ultimately acknowledge change, advances in scientic knowledge, and spiritual progress. I know there are many of you who do not feel the way I do about this. I understand that I speak only as an individual when I express these thoughts, and I do not represent my church. But it is my conscience that tells me to be Catholic, and to remain Catholic, and it is my conscience that tells me that gay people are the children of God just as we are. -- As many of you have asked about this, I hope it clarifies my position. Please continue to write to me, and please know how much I value your response to this book. Tomorrow, October 29th, I leave on my book tour for the promotion of Christ the Lord. So far, the reception of the book has been quietly astonishing. Reviews have been far more kind than I ever expected, and the the talk on the internet is far greater than I ever imagined it would be, if I imagined it at all. Let me make a few statements before I leave you for an extended period of meeting my readers face to face. First off, there is much misunderstanding about this book floating around, and misinformation about me. This book, as I've already explained, is a sincere attempt to bring to life in fiction the world of Jesus of Nazareth, whom I believe, is the Son of God. The Four Gospels are definitely the main framework for the story, the main source for it, and the firm structure into which any fictional liberties are carefully placed. Use of the Apocrypha is extremely limited in this novel, and the reasons for the use of early legends about Jesus' childhood is fully explained in The Author's Note in the book. I do not have any particular interest in the gnostic gospels. They do not figure in this book at all, as far as I know. Also I have not written anything at all resembling the Da Vinci Code. I thought the Da Vinci Code was a scream. Regarding my return to the Catholic Church in 1998, this had nothing to do with my husband's illness, as he did not become ill till four years later. And it had nothing to do with my own illness in 1998 which happened afterwards. My return to faith is described in The Author's Note as well. It was not something that happened over night. It came about over a period of years. I make these statements because as I check out the blogs at night, I'm amazed at the momentum of false statements about me and the book and the opinions generated by these false statements. There is something frightening about seeing the same mistaken assumption repeated over and over again from blog to blog. Of course this chatter will undoubtedly die down at some point, and it may or may not affect the fate of the book in the Public Square. Whatever the case, if you've followed me this far, let me ask you to be open minded about Christ the Lord. I am not exaggerating when I say that the book surprises people. I'm very much looking forward to this tour for all the obvious reasons: I'll see my readers, hear their voices, experience their presence in positive and fortifying ways. And this publication is especially thrilling to me because my conversion was so intense and so total, and this book represents for me the pinnacle of what I have attempted in a lifetime of writing. Understand, I've never written anything without zeal. But I do feel that all my previous research and all my earlier writing was preparation for this. Please do email me at�anneobrienrice@gmail.com�with your comments on the book, or with any questions you might haave, or about anything really. Use the subject line if possible to give some idea of your reason for writing. I answer as much of the mail as I can. And the subject lines help me to keep it in some kind of order in my mind as I proceed. Be assured that I appreciate completely your interest in this book, or whatever interest prompted you to read this message. And I will be reading and answering mail on the road. Take care and be well, and love, Anne. Dear Ones --- As many of you know, my new novel will be published in about a month. I've not said very much on this because perhaps there is so much to say. But let me make a few introductory remarks now. 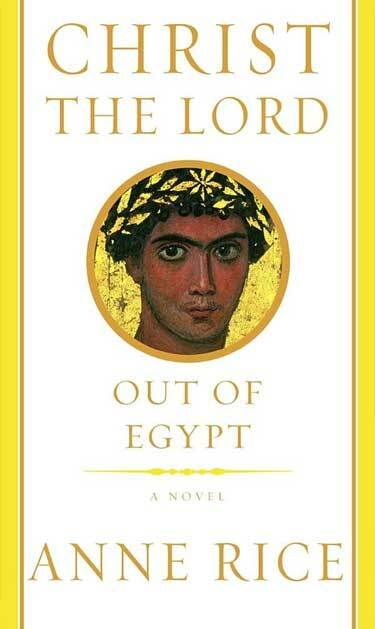 Christ the Lord -- Out of Egypt is a novel about Jesus as a child, a boy of seven. And the story is told from his point of view. The research for this book has been endless and thrilling and at times confusing. I'll post more about the research, the sources in all fields, including archaeology, social history of the first century, Jewish history, Jewish law and customs, New Testament studies, etc., as time goes on. An entire bibliography of works consulted would be very simply impossible. -- What I want to say here is this: every effort has been made to make the entire world of this book accurate according to all the records we possess. This is the Jesus who was born in Bethlehem, celebrated by angels, visited by shepherds, and the Magi. This is the Christ of the four gospels in whom I believe. -- In a way, the novel is the story of Christmas told in a new way -- from the point of view of Jesus Himself when he is old enough to start talking seriously about the mysteries surrounding His birth. --- My life has led to this book. I wish to congratulate you upon the splendid novel you have written about the life of Jesus....I am confident that your writings will contribute to a great harvest of souls who need such inspiration today.